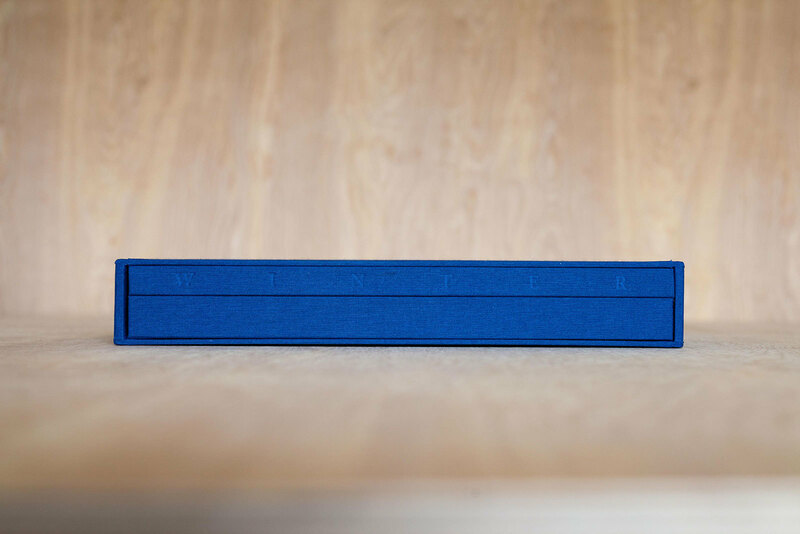 Winter has been designed, typeset by hand and letterpress printed by Jamie Murphy with much grateful assistance from Michael Simpson, Jordan Huysmans and Rauiri Conaty. 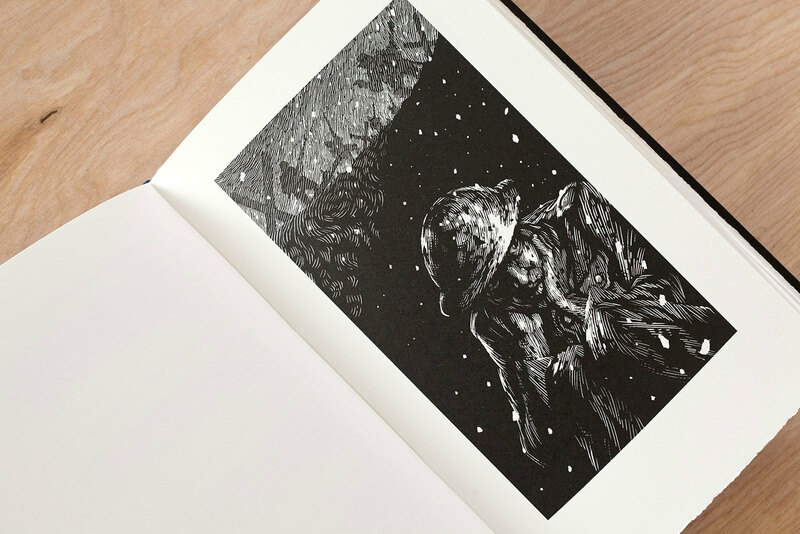 David Rooney’s illustrations were first created using his scraperboard technique from which magnesium plates were then made. The 12 and 18 point Caslon Old Face (1916) was cast into fonts by Neil Winter at The Whittington Press. The book has been cranked through a Western style proof press at Distillers Press, NCAD. The text pages are Zerkall 225 gsm mouldmade. The bindings have been executed by Tom Duffy and his team in Dublin’s Five Lamps area. Seventy two copies have been printed. Presented in a protective slipcase, copies 1—40 form the standard edition. 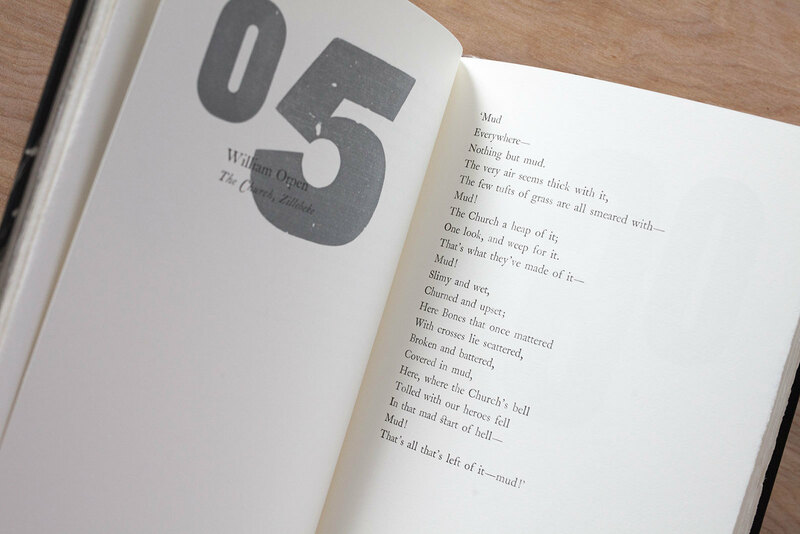 These have been quarter bound in cloth with printed Hahnemuhle paper sides, accompanied by a cloth bound portfolio containing experimental settings of ten of the featured poems in folded broadside format. Similarly bound, books marked i—iv are intended as artist proof copies. Housed in a solander box, copies A—Z form the De Luxe edition. 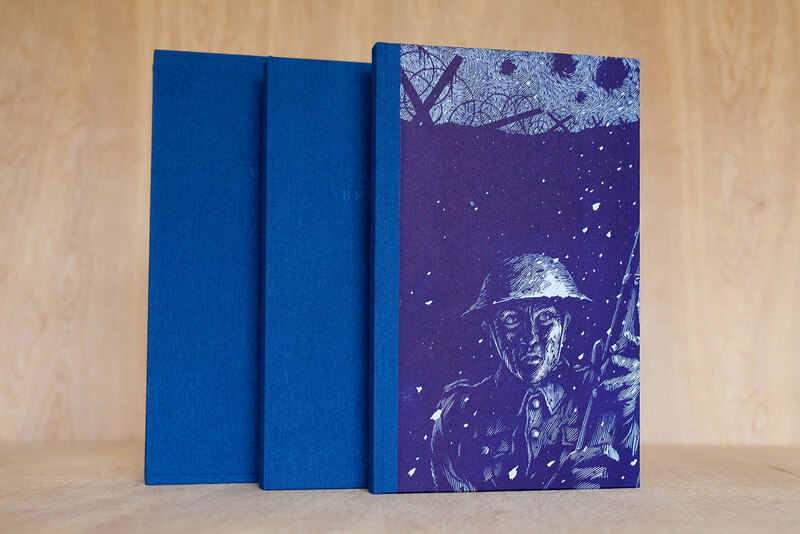 These are quarter bound in Pentland goat with printed Hahnemuhle paper sides, accompanied by a cloth bound portfolio containing experimental settings of each of the poems in a folded broadside format. Presented in a protective slipcase, copies 1—40 form the standard edition. The book has been cranked through a Western style proof press at Distillers Press, NCAD. The text pages are Zerkall 225 gsm mouldmade. The bindings have been executed by Tom Duffy and his team in Dublin’s Five Lamps area. Seventy two copies have been printed. 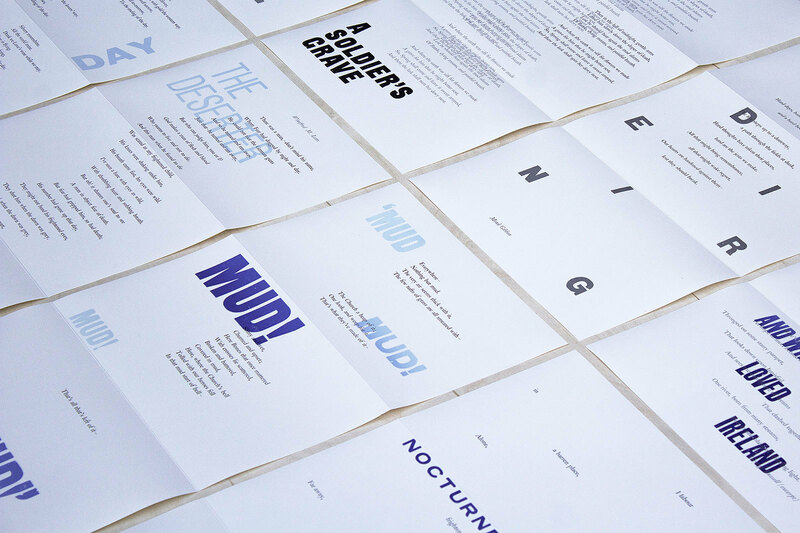 Presented in a protective slipcase, copies 1 — 40 form the standard edition. These have been quarter bound in cloth with printed Hahnemuhle paper sides, accompanied by a cloth bound portfolio containing experimental settings of ten of the featured poems in folded broadside format. 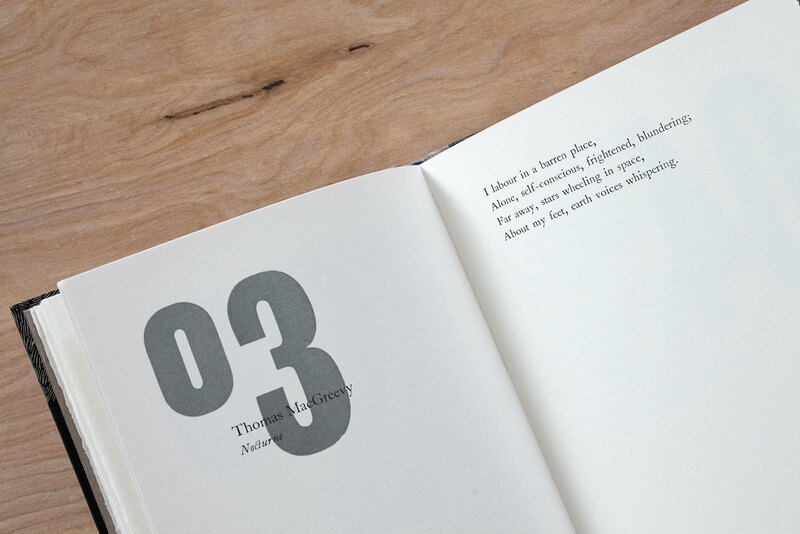 Similarly bound, books marked i — iv are intended as artist proof copies. Housed in a solander box, copies A — Z form the De Luxe edition. These are quarter bound in Pentland goat with printed Hahnemuhle paper sides, accompanied by a cloth bound portfolio containing experimental settings of each of the poems in a folded broadside format. Including poetry by Thomas Carnduff, Monk Gibbon, Thomas Kettle, Francis Ledwidge, Winifred Mary Letts, Clive Staples Lewis, Patrick Macgill, Thomas Macgreevy, William Orpen, George Russell, Dora Sigerson Shorter, Geoffrey Studdert Kennedy, Katherine Tynan and William Butler Yeats.